Whether you have gas burners or a grill to work with, or simply a standard broiler, making roasted red peppers is easy. The name is a bit misleading since these peppers are really charred more than roasted, but the end-point is the same: separating the tough skin from the silky flesh of sweet peppers. Charring makes it easy to remove the skin, and the heat of the process softens the peppers, turning them from snappy to luscious. Two methods are outlined below. For more step-by-step instructions with photos, see How to Roast Peppers Under a Broiler and How to Roast Peppers Over a Flame. Remove any stickers from the peppers and rinse them with cool water. Pat them thoroughly dry. Heat a broiler. Place the peppers under the broiler and cook until the skin is charred pretty much all over. You may need to turn and rotate the pan a few times to get them evenly charred. Watch them carefully, while you want the skin charred, you don't want to burn the whole pepper. If some cook much more quickly than others, remove them and continue cooking the not-yet-done ones. After the peppers have sat, simply peel off the blackened skin - it should slip right off. For less mess, you can do this under cool running water. 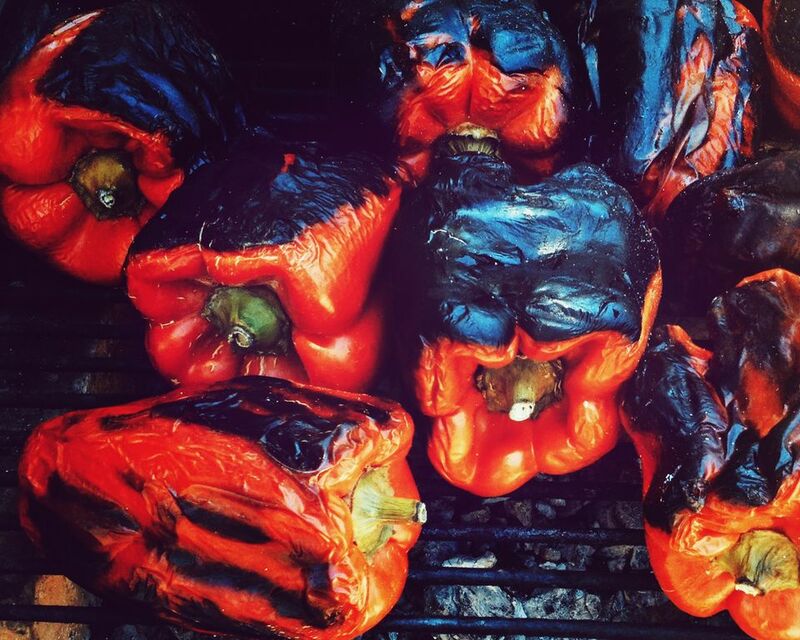 Place whole peppers on a grill or gas burner and cook, turning as necessary, until charred all over. Set peppers aside. For softer peppers, cover them; for firmer peppers, leave them uncovered (see above). Let peppers sit for 10 to 15 minutes. Pull out the stem and core, as well as any seeds, and slip off the charred skin from each pepper. You can pull them into pieces as well if you like. Make it really easy on yourself and do all this under running water, if you like. However you roasted them, serve roasted and peeled peppers re-warmed, at room temperature, or use them in a recipe. Or, store roasted peppers, covered with olive oil, for a few days covered and chilled. Roasted peppers also freeze beautifully - simply place them in doubled resealable bags and freeze for up to 6 months.